As grandparents you are an integral part of both your children’s and your grandchildren’s lives. You’re the rock that keeps the family grounded and your help and support is so important. But what can you do when your grandchild is born with a disability? You want to help, but you may not be sure what’s the best way to help. Give Time: As the parent of a child who is blind and multiply disabled I know that there is one thing I never have enough of: TIME! My son requires so much attention it’s hard for me to get dinner on the table, let alone research therapies or take him to his doctor’s appointments. I need help and I’m very happy to get it! Grandparents are perfect baby sitters even if all they do is sit with the child while mom makes dinner or cleans the house. Be Specific: If there are certain things you are good at, let your children know. Do you like to cook? Offer to make meals for the family! Or maybe you have the time to drive around town and get some errands done or pick up some groceries. That’s all very helpful! Help with the Other Kids: If your children have other kids, this is a great time to volunteer your services. Pick the kids up from school, spend time with them, and have fun. It’ll be helpful to the family and you’ll also be showing the other kids that they haven’t been lost in the shuffle. Lend an Ear: Sometimes it’s nice to be listened to. Allow your children to tell you about what’s bothering them and how they feel. This can be a real relief for them. Learn as Much as You Can: Find out as much as you can about your grandchild’s diagnosis, if they have one. Try to use the correct terminology and keep up to date on therapies and treatments. The internet is a great place to start, but you can also ask your children if they have anything they’d like you to read. Avoid Comparisons: It may be obvious, but it can be hard to let your visually impaired grandchild grow and develop at their own pace. It’s so natural to compare them to their siblings or cousins. Remember, vision is so key to learning that development will be slower, even without additional disabilities. Help your children by reminding them that it’s OK to take things one day at a time and that no one is in a race here. We’re all doing our best. Express Your Joy: Learning that your grandchild is blind is sad, but try to move past that sadness. Your grandchild is beautiful and amazing and there are so many things that they do that astound you and make you feel proud. I know it can be hard at times, but try to focus on the positive whenever you can and encourage your children to do the same. Laugh: I think the best gift my father has given me is the gift of laughter. Somehow he is always able to find the hilarity in any situation, and this can make everyone feel just a little better. Sometimes it’s OK to laugh and smile. Respect Differences: Your opinion is valid, but it’s not the only one. So many families these days come from mixed religions and backgrounds and it’s important to remember that we all see the world a little differently. Don’t let those differences get in the way of a supportive relationship. Be You: You have unique gifts yourself that can’t be replicated. Be yourself and let your children find comfort in the fact that you haven’t changed. Be the grandparent you’ve always wanted to be. Read books to your grandchild, play, and have fun. That’s what it’s all about! Your presence is so important for both your children and your grandchildren. Be there for them and help out in any way you can. Listen to what your children have to say and offer your support and guidance when they ask for it. 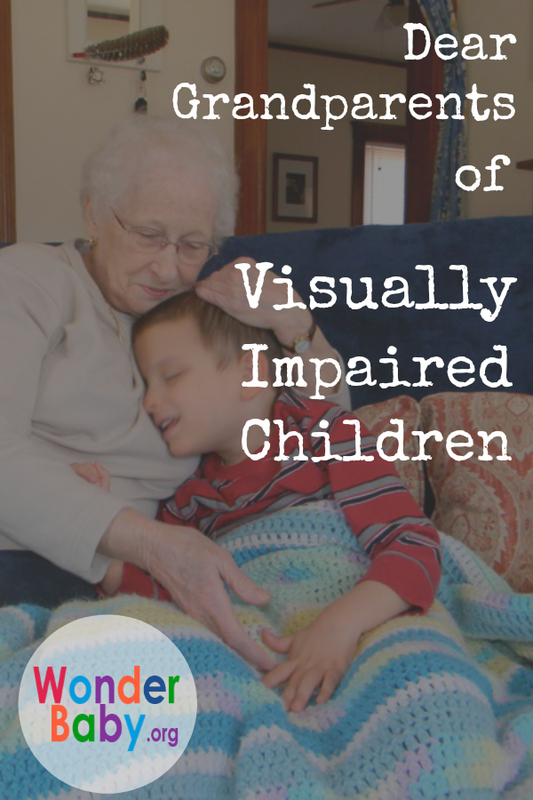 If you’re looking for more ideas on how to interact with a child who is blind, you may want to read In Celebration of Grandparenting: For Grandparents of Children with VIsual Impairments. This books offers simple but powerful advice on how to relate to your children, how to play with your grandchild, and how to make a difference.